you have any questions don’t hesitate to contact us. We would love to help you find the perfect place. Located directly on Main Street in Breckenridge this beautiful home features luxury finishes and just like all of our other vacation rentals won’t disappoint. Property features a roof top hot tub, two master suites and 3x HDTV’s. Vacation rental is within walking distance to the BreckConnect Gondola. With just over 9, 000 square feet of living space this Breckenridge vacation rentals is truly a castle. The home boasts a theater room, wine cellar, sauna, game room and a full wet bar not to mention ski-in/ski-out access! Perfect for large families and group gatherings. Sleeps a staggering 27 people. Well appointed luxury 5 bedroom, 4 1/2 bath home sits 2 1/2 walking blocks to the Base of Peak 8 in the exclusive Boulder Ridge subdivision. Plus ski-in right to the hot tub via the Boulder Ridge Easement trail and soak the days play away. This professionally decorated home awaits your family vacation. Luxury amenities abound in this 4, 700 sq. ft. four bedroom Breckenridge vacation rental. From the built-in boot dryers to the heated two car garage. Parents, you can relax in your own private hot tub while the kids play air hockey. Or curl up by one of the three gas fireplaces with a good read. Beautiful 4 bedroom, 3 1/2 bathroom home nestled amidst the pine and aspen trees in the Breckenridge historic district. Stroll down to Main Street where you will find ample dining, shopping, and nightlife opportunities. HDTV/DVD, surround sound, iPod docking, WiFi, private hot tub, and gas fireplace. Luxury custom home located near the Gold Run Nordic Center and Breckenridge Golf Course. 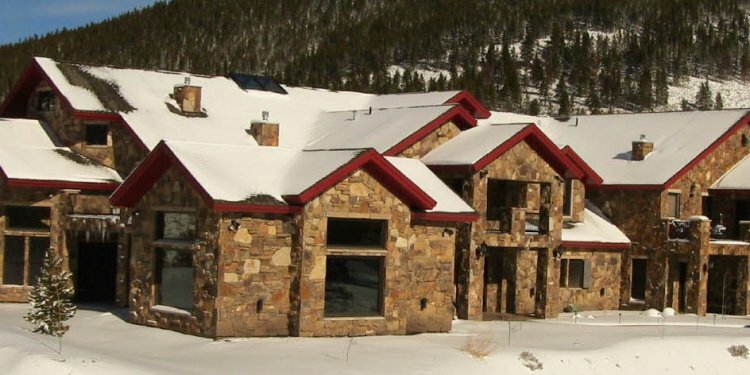 The Highlands Chalet boasts 4 bedrooms and 3 1/2 bathrooms and is just a short 3.5 mile drive to the Breck Connect. Amenities include: private hot tub, gas grill, HDTV and 2-car heated garage. Sleeps 11. With three king beds, a bunk room with two twin bunk beds and over 4, 800 square feet this mountain home vacation rental is perfect for a multi-family getaway. If the amazing views aren’t enough for you there’s a pool table, card table, BluRay player and an indoor hot tub to capture your attention. With two king beds, three queen beds, and two bunk beds this Breckenridge mountain log vacation home is perfect for multiple couples. Located in a quiet and private area. Perfect vacation retreat for those looking to escape the hustle and bustle of the city. Private hot tub, gas grill, and WiFi. Sleeps 17. Charming mountain home with 4 bedrooms plus a large loft, 3 bathrooms and private outdoor Jacuzzi. Fully equipped kitchen, 55″ HDTV, ping pong table, and living area with wood-burning fireplace. Warm and decorated in mountain decor. Located on quiet Peak 7 and just over a mile to Peak 8 ski mountain. Million dollar views abound from this Breckenridge vacation rental. With massive log beams, a blazing gas fireplace, 55″ 3D TV, pool table, hot tub, and 4 bedrooms 4 1/2 bathrooms this home has it all. The stocked gourmet kitchen is perfect for hosting your friends and family. Kids will love the PS3 and Xbox. Extra-large luxury home. Cathedral ceilings, in quiet neighborhood nearby Downtown Breckenridge and nearby ski areas. Beautifully furnished with in-floor heating, 2 fully equipped kitchens, private deck with BBQ grill and hot tub, plus game room with pool table, heated 1-car garage, and washer/dryer! Perfect for those large reunions, church retreats, or group ski trips, this private Colorado home sprawls out on more than six acres which overlooks the Blue River. You’ll have a private hot tub along with all of the wonder and beauty of the Colorado National Forest right out your front door. Sleeps 26 guests! Spectacular 5 bed 4 bath home sits perfectly nestled in a beautiful forest. This home is 3.5 miles to town and the Breckenridge Gondola which takes you to Peak 7 and Peak 8 ski bases at the Breckenridge Ski Resort. This peaceful lodge has plenty of space to spread out and is close to Breckenridge amenities. Stunning multi-level 5 bed, 3 bath alpine home sits within the Discovery neighborhood on Peak 7, only 1.2 miles from the Independence Chair at the Peak 7 base. Located close to Downtown Breckenridge, yet still far enough away to feel the true solitude of the Colorado Rocky Mountains. Sleeps 10 to 12.